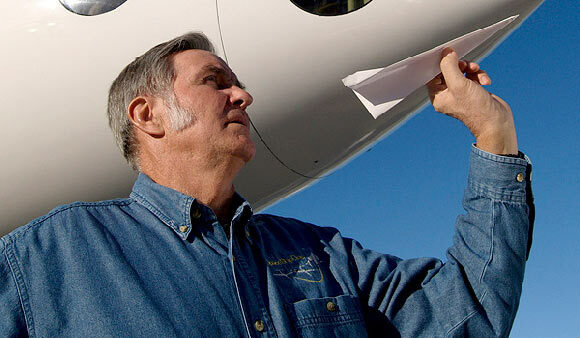 Burt Rutan (formally named Elbert Leander Rutan) is an American aerospace engineer and a pioneer in the fields of aircraft design and space travel. He was born in Oregon in 1943 and raised in California. Burt and his elder brother Richard were both fascinated with airplanes. Their father was a dentist by profession but owned a small plane and was a licensed pilot. The brothers would play with model airplanes as children and soon began designing their own. They entered their model airplanes in competitions where Burt’s entries won awards and soon he came to be recognized as a talented model airplane designer. As a child, Rutan would request his mother to drive him around at high speeds so that he could test out his model airplanes by holding them out the window and judging the aerodynamics and design efficiency. He attended California State Polytechnic University and graduated third in his class in 1965 with a degree in aeronautical engineering. While at college, Rutan built his own “wind tunnel” which is a tool used by engineers to test aerodynamics. He installed this on top of his station wagon and used it to fine tune his airplane designs. After graduating from college, Rutan worked as a civilian flight engineer for the US Military where, among other achievements, he helped fix a fault in the design of the fighter jet F-4. He worked there for seven years from 1965 until 1972. In 1972, he became the Director of Development of the BD-5 aircraft for the Bede Test Centre. He held this position until 1974 when he founded Rutan Aircraft Factory where he developed prototypes for amateur builders. In 1982, he founded Scaled Composites, LLC. This has now become one of the world’s most renowned aircraft design facilities. In a career spanning more than 45 years, Rutan has become known for the uniqueness of his designs. His first project was started in his garage at home and it came to fruition in 1972 in a design which has since then come to be known as his trademark. One of Rutan’s notable designs is the Voyager, launched in 1986, which is famous for being flown around the world without refueling. Other ventures include “SpaceShipOne“, famous for winning the $10 million “Ansari X prize“. This venture was funded by Paul Allen, one of the founders of Microsoft. SpaceShipOne was the first private, manned flight to go into space. This has given birth to the idea of “Space Tourism” – a concept of which Burt Rutan is an avid supporter. For this purpose he has launched a company called “Stratolaunch Systems” along with Paul Allen and former NASA administrator Michael Griffin. This company aims to redefine space travel and the space travel industry. Ruth believes that it is not just the government’s job to further developments in the field of space travel, rather private companies (such as his own) can and should contribute to its development. For his accomplishments, Ruth has won several prestigious awards and honorary doctorates, including the Lindbergh Award. In 2005, he was on the cover of several notable international magazines as one of the 100 most influential people in the world. He was named “Entrepreneur of the Year” by “Inc” magazine for his SpcaeShipOne venture. Rutan is currently 70 years old and has retired from his position as Chief Technical Officer at Scaled Composites since 2011. His research and development work have provided outstanding breakthroughs in the field of aircraft design and space travel, which makes him one of the foremost authorities in these fields in the world today.